17 Day Diet Breakthrough Edition is a healthy diet. I’m no medical expert, but the diet was designed by one! What I do know is that the diet does not include fasting for 7 days, taking a “magical” pill, or drinking lemonade for 3 days in hopes of losing weight. What the 17 Day Diet is about is cutting out sugar, sticking to low-glycemic fruits and vegetables and eating lean proteins. Drinking plenty of water and keeping yourself physically active are also very important aspects of the 17 Day Diet. Probably the most “controversial” part of the 17 Day Diet is its Cycle 1 where all sugar and carbs (with the exception of some fruits and veggies) are banned in order for rapid weight loss to occur. During this cycle toxins are released from the body and hopefully cravings for the “bad stuff” cease. During Cycle 2 and 3 of the 17 Day Diet, more complex carbs are introduced such as grains and starchy vegetables such as potatoes. Cycle 4 is about living your life and eating in moderation. Creating a healthy lifestyle and sticking to it is the theme of this “diet”. So is the 17 Day Diet a healthy diet? The 17 Day Diet appears to be well-balanced, realistic in its approach and the foundation of a long-lasting manageable lifestyle that promotes nutrition, physical activity and enjoying life to the fullest. See for yourself if the 17 Day Diet is right for you. Q. How much water is required on the 17 Day Diet? A. The 17 Day Diet recommendation is that you drink eight 8-ounce glasses of water per day. This is in addition to your hot lemon water and green tea throughout the day. Q. I’ve been stuck in a weight loss plateau for days. What should I do? A. Plateaus are a normal part of dieting as your body gets used to eating the same foods and the same amounts. Cycle 2 is about “body confusion” as you alternate between high caloric days and low caloric days. Increasing your caloric intake for a day should help you break your plateau. Check out our post regarding Diet Cheat Days. Q. Am I allowed to drink coffee on the 17 Day Diet? A. Yes, you are allowed to drink coffee on the 17 Day Diet. Q. Do I really have to have two probiotic servings per day? A. Having two probiotic servings per day really does make such a huge difference in your digestion. 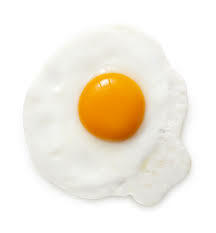 Consuming large quantities of protein during Cycle 1, especially if you’re not used to that amount, may often times prove difficult to digest. Probiotic such as yogurt definitely help keep things flowing and healthy! Q. Do I have to eat yogurt on the 17 Day Diet? A. No. There are other foods that contain probiotics besides yogurt. For a full list of approved 17 Day Diet probiotic-foods, visit our post about alternatives to yogurt. Q. Am I allowed to have diet soda on the 17 Day Diet? A. Dr. Moreno advises us in The 17 Day Diet book against drinking diet soda. Q. Am I allowed to have artificial sweeteners on the 17 Day Diet? A. The 17 Day Diet book recommends that if you’re going to consume artificial sweeteners, to do so in moderation. Truvia is the sweetener of choice if it’s necessary for you to consume. Q. I’m scared to lose weight. Is that wrong? A. I’m sure many of us are scared to peel away the layers and let our true self shine through. Instead of wondering if it’s right or wrong…embrace it! You’ll feel so much better once you lose the weight! Q. When I’m done with Cycle 1 or 2 and I still need to lose weight do I start back at Cycle 1? A. Dr. Moreno explains in The 17 Day Diet book that he prefers you go through all the way to Cycle 3 before going back to a previous cycle to lose additional weight. Once you’ve gone through Cycle 3, you have the choice to go back to either Cycle 1 or Cycle 2. 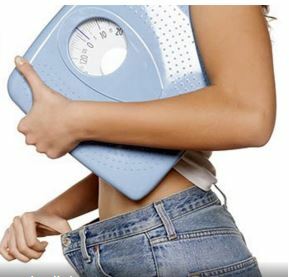 Staying on Cycle 1 for too long, for instance, may actually stall your weight loss. Q. How much lemon do I use in my hot water each morning? A. In The 17 Day Diet book, Dr. Moreno advises us to use the juice of half a lemon. You may decide it easier and more cost effective to use bottled lemon juice. Q. Doesn’t it make sense to begin the diet after the holidays? A. There really is no right answer (and the book doesn’t really address this). I feel this is a personal decision to start a diet before a holiday or to wait… you can’t make excuses forever, though. There will always be another holiday around the corner. Q. Can I eat pomegranates on the 17 Day Diet? They really help my sweet tooth. A. Only on Cycle 3 of the 17 Day Diet are you allowed to eat pomegranates. Even then you are limited to two servings a day and they must be eaten by 2pm– so enjoy your pomegranates! Q. Is the 17 Day Diet safe to try if I am a diabetic? A. In the 17 Day Diet book, Dr. Moreno advises individuals who are Type I Diabetics should not try the 17 Day Diet. Q. I am tired of eating salad. What are my other options? A. The 17 Day Diet food lists are so diverse (depending on the Cycle you’re on) that you have so many choices of foods to choose from. I never understand those individuals who “think” all they can eat is salad when trying to lose weight. How about roasted chicken with veggies of your choosing? A. In the book Dr. Moreno advises us to use the juice of half a lemon. I use lemon juice out of the bottle as that’s a lot of lemons to keep in stock! A. Only on Cycle 3 of the 17 Day Diet are you allowed to eat pomegranates. Even then you are limited to two servings a day and they must be eaten by 2pm. A. In the 17 Day Diet book, Dr. Moreno discusses that those individuals who are Type I Diabetics should not try the 17 Day Diet. A. 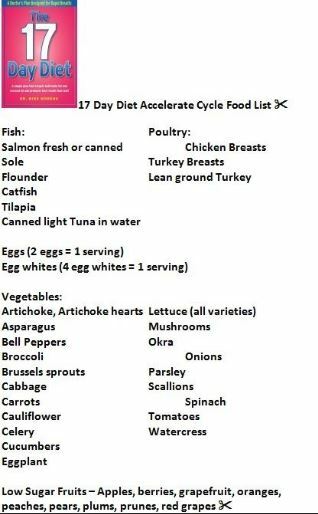 The 17 Day Diet food lists are so diverse (depending on the Cycle you’re on) that you have so many choices of food items to choose from. I never understand those individuals who “think” all they can eat is salad when trying to lose weight. How about roasted chicken with veggies of your choosing?